Roland Quandt shared with the world of official renders and specification of the latest Huawei model, P Smart 2019. Shortly before the end of the year, Huawei intends to show the Huawei P Smart 2019 - a device that will be included in the average price range. At first glance, it is identical to Honor 10 Lite - indeed, we had a similar situation with the models Honor 9 Lite i Huawei P Smart. Huawei P Smart 2019, which code name is "Potter", has a 6.2-inch LCD screen with a resolution of 2340x1080 pixels and an aspect ratio of 19.9: 9. It has an indentation in the dot-shaped screen - the front camera is located in it. The smartphone drives the Kirin 710, there is 3 or 4 GB of RAM depending on the model, and the internal memory - 32 or 64 GB. 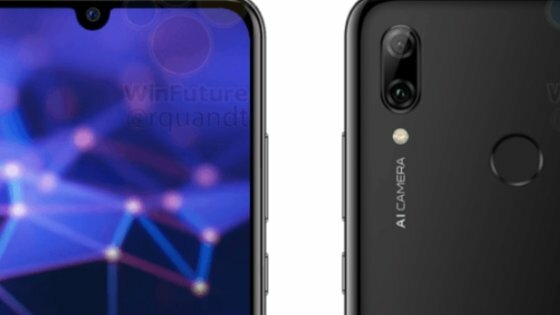 There are no details at the moment, but it's quite possible that it could be the same set as in Honor 10 Lite - with a 24-megapixel front camera and a 13-megapixel main camera with a 2-megapixel camera for depth measurements. The smartphone is supposed to work under the control of Android 9.0 Pie and EMUI version 9.0. Huawei P Smart 2019 will probably be officially launched in the next few weeks, and the price is likely to be around 250 euro. In Europe, the device will be available in "Midnight Black" and "Aurora Blue" colours. Source Winfuture.de; viewed: 560 times.